When the Gents decided to construct a roundhouse styled barn on their property, little did they know they would be continuing a practice established on their land by the previous occupants 2000 years ago. Once they had applied for planning permission, their land had to undergo an archaeological survey, because it had been noticed in the archaeological books that there were crop marks on their land. The Museum of London Archaeology conducted a geophysical survey, which identified up to four ditched enclosures and a possible driveway. Trial trenching confirmed the presence of these ditched enclosures. Further archaeological remains comprising a pit and a possible ring gully were also identified. A small collection of late Iron Age pottery was also found, comprising 66 hard and well fired shards from bowls and small jars. One thick, rounded rim was revealed to be characteristic of late Iron Age storage jars of the early 1st century AD. All of which pointed to evidence of an Iron Age farm that would have occupied the site around 2000 years ago. The presence of a droveway suggests that the occupants moved livestock across the site. Astonishingly, the archaeologists thought that the gullies formed a west facing entrance to a ring ditch that once surrounded a roundhouse – in the same location where the Gents were intending to build. Consequently, the modern era roundhouse had to be built slightly to the side, so that it would not be built directly over the historical artefact. Originally the roundhouse would have provided shelter for human occupation, but the Gents’ plan was for the roundhouse to only provide shelter for cattle. Storage for grains was built elsewhere. The Gents now have a brand-new modern-day roundhouse at the end of their drive, with many cattle, including some rare breeds, residing inside. 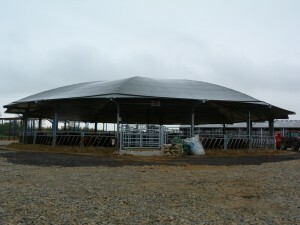 The roundhouse is split into numerous sections, which rotate and move so that the cattle can be herded into different areas, giving the cattle the chance to move around while the roundhouse is cleaned. The design has proved to be very beneficial. ‘It’s like a big umbrella’, Mr Gent said, referring to the roof of the roundhouse. Similar to roundhouses 2000 years ago, the roof has a central ventilation outlet in the centre, which acts as a natural chimney to allow air to circulate within the roundhouse, contributing to a healthy and clean environment. 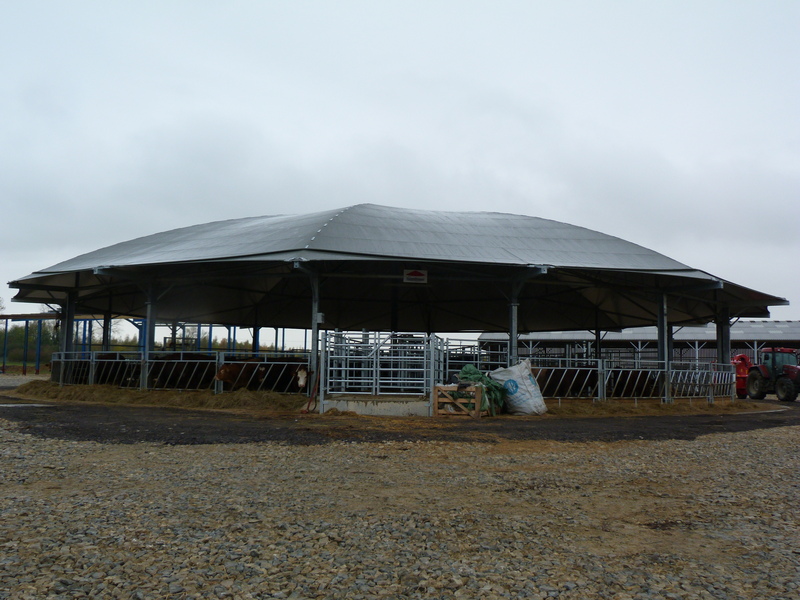 The open-sided design provides plenty of natural light and helps to prevent illness and maintains the wellbeing of the cattle. Mr and Mrs Gent are incredibly happy with their roundhouse and are convinced that as the season moves into winter, it will provide the best possible housing environment for their cattle.